UK Prime Minister David Cameron said Israel had a right to defend itself when it initiated Operation Protective Edge in Gaza last summer. Cameron, who is in the midst of a re-election campaign, made the comments in an interview with the Jewish Chronicle due to be published on Thursday. Cameron told the Jewish Chronicle: “What I’ve seen is the attacks that take place on Israel and the indiscriminate nature of them. 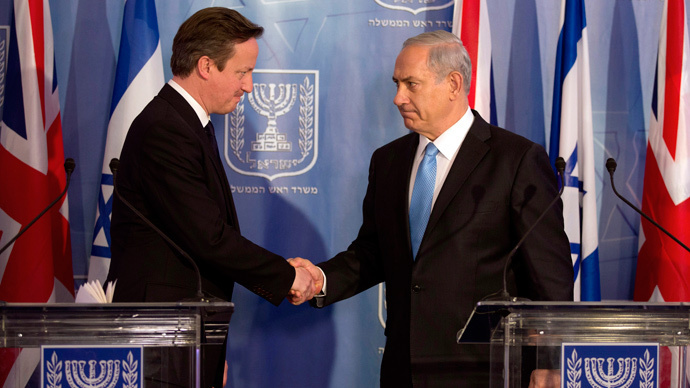 The British prime minister has been outspoken in his support of Israel in the past. In September 2011, the British government amended a universal jurisdiction law, which had been used by activists to gain an arrest warrant for war crimes against Israel’s former foreign minister Tzipi Livni in 2009. Parliament changed the legislation so that the head of public prosecutions must give approval to a request for arrest warrants under universal jurisdiction. Livni was given special temporary diplomatic immunity when she visited the UK last year to protect her against arrest and prosecution for alleged breaches of international law. The coalition government’s ties to Israel go beyond politics, with Chancellor George Osborne having spent last Christmas with his family in Israel. This trip included a private visit to Netanyahu’s residence, according to Haaretz. While Labour leader Ed Miliband has described himself as a “friend of Israel,” he was outspoken in his criticism of the country’s military operation in Gaza last year. Scottish National Party (SNP) leader Nicola Sturgeon has been the most avowedly pro-Palestinian political leader of the election campaign.